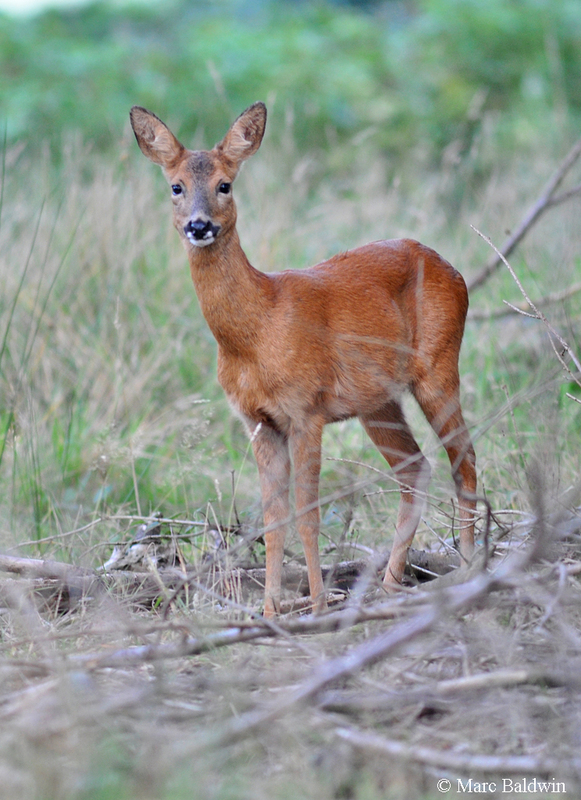 In his 1995 book The Roe Deer, Richard Prior draws attention to Capreolus having “large ears constantly moving”. Indeed, even when their owner is at rest, a deer’s ears are scanning for any sound. The ears of a deer are highly (and independently) mobile and can be rotated almost 180 degrees; at the same time, their large size and cupped structure allows for the efficient gathering of sound waves. Despite the observations we can make on the physical characteristics of deer ears, data on hearing thresholds are somewhat lacking – as before, where we have data they generally pertain to the White-tailed deer. In a series of experiments on hand-reared White-tailed deer held at Texas A&M University’s College of Veterinary Medicine, biologists sought to establish hearing frequencies in order to assess the effectiveness of whistles as deer deterrents (see Interaction with Humans for more on deer-vehicle collisions). The study, led by Ken Risenhoover, measured what are called “evoked potentials” – these are electrical responses of nerves to a stimulus, so they wire the deer up to an audiograph and play pings of varying frequencies and volumes to it through headphones. From these data it appears that the deer had the greatest hearing sensitivity between 1 and 8 kHz, with a peak sensitivity at 4 kHz and a range from 0.5 to 12 kHz (at 85 dB). In the summary of results on his website, Risenhoover notes “recorded deer vocalizations reported from the literature … range between 1 and 9 kHz”, so the main hearing sensitivity ties in quite nicely with the call frequency data. A similar study, led by Gino D’Angelo at the University of Georgia and published in the Journal of Wildlife Management during 2007, found their White-tailed deer were able to hear in the range of 0.25 to 30 kHz, with peak sensitivity between 4 and 8 kHz. These findings compare favourably both to Risenhoover’s data and to a study of Reindeer (Rangifer tarandus) published by Kjetil Flydal and colleagues in 2001, which found that this species could detect sounds within the range of 70 Hz to 38 kHz, with a peak sensitivity at 8 kHz. So, the upshot of these studies is that deer have a hearing range similar to that of humans (typically 20 Hz to 20 kHz), but with the ability to detect sounds within the low ultrasonic (20 kHz and above).